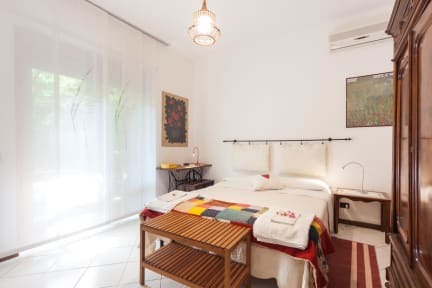 - Two Double rooms Ensuite (bathroom inside the room). - One Double room with a PRIVATE but EXTERNAL bathroom located in the corridor. - One external free car parking, ask for availability. We have also a second one internal suitable for small cars only. 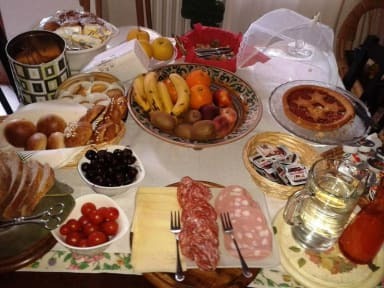 - A genuine large breakfast with a sweet and savory buffet, will be served at our main table located in the living room (we share our living room with our guests), usually between 7:30 am and 9:30 am. But we can prepare it even at a previous time for early departures, simply ask. - We would like to remind our guests that this is a 'non-smoking' establishment, therefore, there shall be NO SMOKING in any part of the house. Our apartment lies at the building number 6 of Via Ventiquattro Maggio, very close to the historical centre of Verona, getting to the main monuments, like arena (950 meters), the dom (750 meters), romanttheater (980 meters), piazza Delle Erbe and the nearby Scaligere arches or Juliet's house, is always an easy walk (10 / 12 minutes or 3/5 bus stops). Please, it is very important to us, that you indicate inside your booking form your supposed check-in time according with the following rules..
We are both workers (according to the Italian law about b&bs), that means we can not be at home all day long, so please your supposed check-in time should be settled possibly before 10:30 a.m. (you'll get the key for sure, the room if clean) or in the afternoon from 14:30 to 19.30. According with our job we can arrange different check-in time but has to be decided together previously. The balance due payment will be per cash upon arrival.